ACTION ALERT: “Pulling Back the Curtain on Wendy’s” National Week of Action, Oct. 22-28! Students across the country gear up for a week of coordinated protests to expose human rights abuses in Wendy’s produce supply chain and demand a commitment to the Fair Food Program! Earlier this summer, caving to massive pressure generated by the Fair Food movement’s national boycott, Wendy’s announced its decision to move the vast majority of its tomato purchasing away from the Mexican tomato industry to U.S. and Canadian greenhouses by year end. But we, as young people and steadfast allies to the CIW, are far from being fooled by Wendy's new tomato sourcing strategy. Contrary to the misinformation released by Wendy's, including the claim of the"inherent benefits of safe, indoor working conditions" in greenhouse operations, this shift is nothing more than another PR ploy to deceive consumers. As CIW debunked early on, greenhouses do not inherently shield farmworkers from sexual violence and exploitation — and without meaningful enforcement and monitoring, abuses will undoubtedly flourish with impunity. Wendy’s: we’re on to your empty sustainability rhetoric and your phony auditing schemes and we’re not going anywhere! As the school season kicks back up, we are mobilizing our campuses and communities to pull back the curtain on Wendy’s shameful façade of social responsibility and expose the truth behind the tomato that tops a Dave’s Single. We’re calling for a national week of action from Oct. 22-28 to demand real transparency and verifiable protections against sexual harassment, forced labor and other human rights abuses in Wendy’s produce supply chain. And, inspired by the CIW’s brilliant tradition of using popular education and theater as a tool to organize, agitate and raise consciousness among farmworkers and consumers, we’re inviting SFAers to include a theater skit about the Wendy’s Boycott as part of the protest! 1. Hit the streets — Organize a creative action at your local Wendy’s or on your campus, and perform a theater piece to amplify your message! Whether you’re planning a vibrant march, an energetic picket or another type of demonstration, be sure to reach out to us for resources and support at organize@sfalliance.org. 2. Educate your community about the boycott — Plan a “teach-in” about the fight for Fair Food or invite a farmworker leader of the CIW and an SFA member to give a presentation on your campus! Educational events are a great outreach tool to spread the word about the boycott, recruit new members to join organizing efforts on campus, and build up hype before action day. You could also test run your teatro skills at the event. 3. Post your theater performance on social media — As Wendy’s trolls the Internet with snarky comebacks and cheap deal promotions, let's put the fast-food giant’s dirt on blast by posting your performance online using #BoycottWendys! Oh, and don’t forget to @Wendys. As Wendy’s target market, we won’t conform to theatrical announcements and empty promises. We are not mindless props for corporate profits, and we demand justice for the women and men whose backbreaking labor in the fields makes it possible for Wendy’s executives to line their pockets. The battle against Wendy’s is far from over, and now pushes forward with more righteous urgency than ever before. Join us! Drop a note at organize@sfalliance.org if you’re planning on taking action from Oct. 22-28. Stay tuned in the weeks ahead for an organizing kit, including a guide to preparing your theater performance, a sample press release and more! And if you haven’t done so already, apply for the 2018 SFA Encuentro convening from Sept. 20-23 in Immokalee, FL, where we’ll dive deeper into strategy plans for pulling back the curtain on Wendy’s. Applications are due September 1. Milk with Dignity Program already making great strides in the Vermont dairy industry! 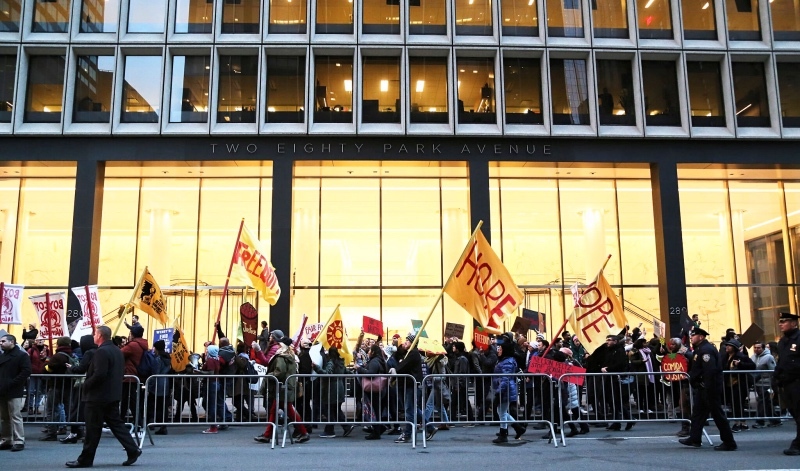 Following Wendy’s move to repatriate its tomato purchases from Mexico in response to consumers’ human rights concerns – but continued refusal to join the Fair Food Program – farmworkers and allies prepare to turn up the heat on the company’s leadership in the Big Apple! Mark your calendars, Fair Food Nation! If you’re interested in supporting the mobilization or in organizing a caravan to NYC, get in touch at: organize@allianceforfairfood.org! Only a few short months ago in March, over 2,000 farmworkers and their consumer allies – from New York and around the country – marched in Manhattan in a powerful display of support for the CIW’s five-day Freedom Fast, a fast carried out by nearly 100 farmworkers and allies on the sidewalk outside of Wendy’s Board Chair Nelson Peltz’s hedge fund offices on Park Avenue. The fasters were calling on Wendy’s to pull its tomato purchases from the Mexican produce industry, where sexual violence against women and other human rights violations are endemic and go unchecked. Instead, the Fair Food Nation was calling on Wendy’s to return to Florida’s tomato industry, where the company’s former suppliers have implemented the award-winning Fair Food Program in partnership with the CIW, transforming the fields into “the best working environment in U.S. agriculture”. In June, bowing to the pressure generated by the farmworkers’ campaign — including a petition that collected well over 100,000 consumer signatures in support of their demands – Wendy’s came half-way home. In a major announcement earlier this month at its annual shareholder meeting in Ohio, Wendy’s declared its intention to repatriate its tomato purchases from Mexico. It did not, however, agree to join the Fair Food Program. Instead, Wendy’s announced that it would be shifting its purchases to greenhouses in the US and Canada. Without a doubt, halting purchases from one of the hemisphere’s most abusive produce industries represents a step in the right direction, and the move is proof that when workers and consumers join forces to make their concerns about sexual violence and other human rights violations heard, Wendy’s has no choice but to listen. Indeed, Wendy’s cited the growing focus on “working conditions for tomato farmworkers” driven by the efforts of the “CIW and other associated organizations” as one of the principal reasons for the move. However, Wendy’s decision to continue evading the award-winning Fair Food Program, and instead rely on non-FFP farms and a discredited model of superficial third-party auditing to monitor its supply chain, is unacceptable. But it is not a complete victory, and now it is time to cross the finish line. Neither farmworkers nor consumers will settle for anything less than the worker-driven Fair Food Program and its verifiable guarantee of fundamental human rights for the women and men who harvest our produce. What’s more, we will not allow Wendy’s or Board Chair Nelson Peltz to turn their backs on farmworker women and men’s urgent demands for justice, respect, and true partnership. ANNOUNCING: 2018 SFA Encuentro in Immokalee! 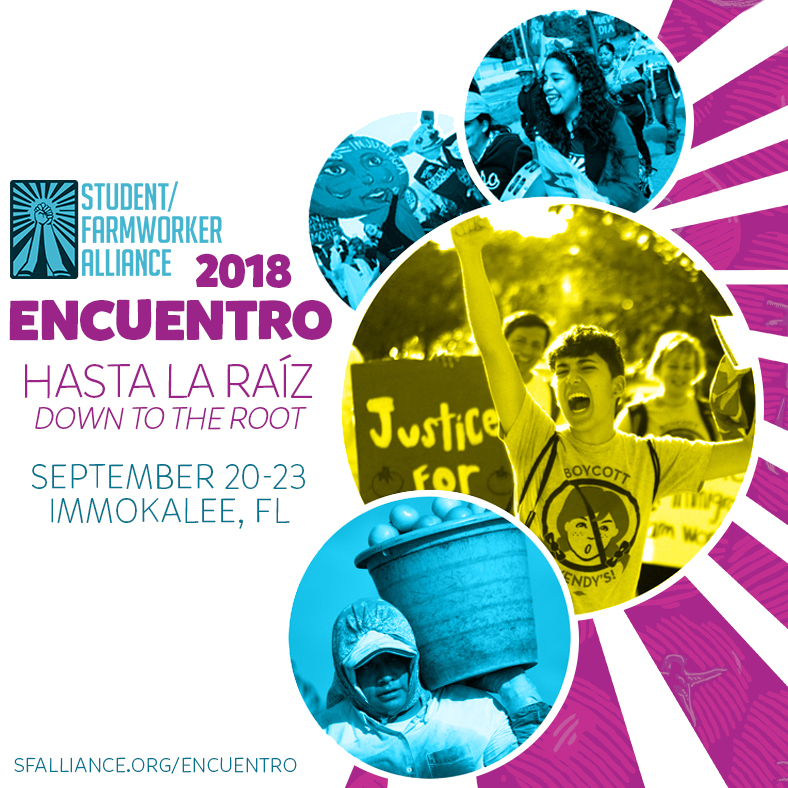 Application is live for the 2018 Student/Farmworker Alliance Encuentro: Hasta la Raíz "Down to the Root,” set for September 20-23 in Immokalee, FL! This year, 2018, marks 25 years since the birth of the CIW’s tremendous struggle to uproot generations of exploitation in the fields. This historic farmworker-led organization has transformed labor conditions for tens of thousands of workers in the U.S. agricultural industry through the Fair Food Program, creating an international blueprint to eradicate and prevent abuses, from wage theft to sexual assault, in the workplace. But this work was not done alone. Together with farmworkers, students, young people and community allies have strategized and organized to bring corporation after corporation to the negotiating table with CIW. This year's Encuentro gathering will go Hasta la Raíz "Down to the Root" of this incredible history to reflect on lessons CIW and SFA have drawn from past victories and build upon them as the Wendy's Boycott surges on with more force than ever before. The moment for us to come together couldn't be more perfectly timed. Just last Tuesday, SFAers and CIW members packed the house at Wendy's annual shareholder meeting, where the company unveiled plans to shift its tomato purchases (yet again) to greenhouse operations in the U.S. The fact that one of the world's largest buyers pulled nearly all its business from the abuse-ridden Mexican tomato industry is a victory in itself, and let there be no doubt that our movement pushed Wendy’s to make this drastic decision. Now, we must fight harder than ever to push Wendy's over the edge to sign a Fair Food Agreement with the CIW. From September 20-23, we're bringing together brilliant young organizers from across the country to devise a winning strategy in the Wendy’s Boycott. At the Encuentro, we will build our organizing skills and leadership as a network, learn directly from the farmworker community in Immokalee, and delve deep into SFA’s rich history in the Campaign for Fair Food. Submit an application to join us at the 2018 SFA Encuentro this fall, and don't hesitate to hit us up if you've got any questions at organize@sfalliance.org. Bowing to farmworker and consumer pressure, Wendy’s declares intention to bring tomato purchases to U.S. greenhouse operations in surprise announcement at annual shareholder meeting! TAKE ACTION NOW: Email Wendy’s executives ahead of Tuesday’s annual shareholder meeting! TODAY: Flood Wendy’s Board of Directors’ inboxes with support for farm labor justice! Tomorrow, June 5th, Wendy’s executives will be meeting with shareholders at their headquarters in Dublin, Ohio — and whether they like it or not, Fair Food is going to be squarely at the top of the agenda. As we write, dozens of farmworker families are on the road to Columbus, readying to join scores of allies from across the Midwest at Wendy’s doorstep for a high-energy protest calling on the fast-food giant to join the Fair Food Program. Whether you’re headed to Columbus or reading this at home, you can add your voice to the growing Fair Food chorus today. We’ve proven time and time again that even the world’s largest corporations can be held accountable for their failure to protect the human rights of farmworkers in their supply chains — but it takes concerted action to make ourselves heard. Show your unwavering support for farmworkers’ human rights by sending an email to Wendy’s Board of Directors today! Tomorrow, farmworkers and their allies — many of whom fasted for five days in frigid temperatures outside of Board Chairman Nelson Peltz’s offices just a few months ago — will confront the fast food giant’s top executives face-to-face, including Mr. Peltz. Today, YOU can amplify farmworkers’ message, and make sure Wendy’s knows that the women and men who harvest our food are not alone in this fight. And then — please share the action far and wide! 2018 summer protest season kicks off with a 70+ action in Sarasota!